Task-switching means alternating among two or more sets of directions for responding to similar stimuli. In order to do task-switching well, one must use part of working memory to do a task, and another part to hold in mind what task to do. Task-switching is one of the executive functions thought to be important in making and executing plans and attaining goals. This skill appears to be especially difficult for people with ADHD. Medication used for ADHD appears to improve task-switching, but practice slso appears to lead to such improvement. 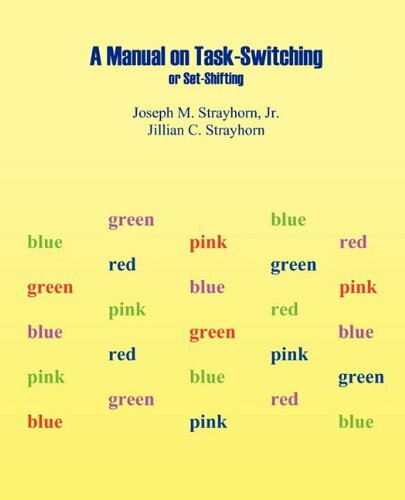 This manual provides an explanation of current thinking about task-switching, in simple language. It tells how to do several games for task-switching practice. It also provides many worksheets whereby students can practice task-switching skills while also practicing useful academic skills: math facts, math word problems, and word-reading. The first author is a child and adolescent psychiatrist and adjunct faculty member at Drexel University and the University of Pittsburgh. The second author, his daughter, is a student of psychology at Cornell University.